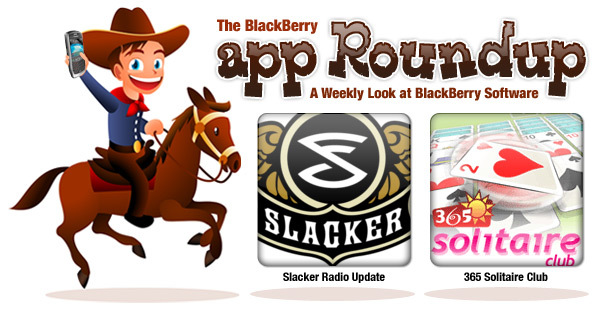 BlackBerry App Roundup for November 6th, 2009! That's right... RIM's official storefront has been updated and is now available. The new version brings us up to 1.1.0.23. To ensure you have the latest and greatest version of App World I recommend you give it an install if you haven't already. 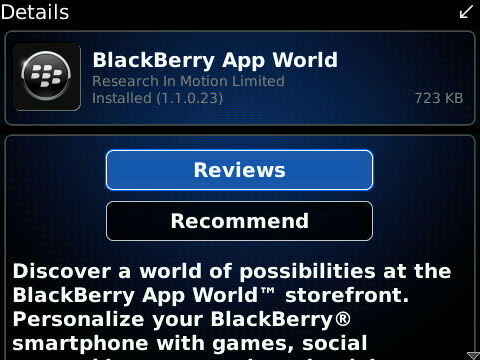 If you haven't received a notification on your Berry by now, head on over to BlackBerry.com to download and install... and let the on-device app browsing begin! If you're a regular user of Slacker Radio, heck, even if you're not, a new and improved upgrade has been released. As per usual, no changelog was made available with the update... But still, it's always best to stay up-to-date with your various apps. I highly encourage you to check out Slacker if you haven't before. It allows you to create and listen to your very own personalized stations. I'll let you mull that over a bit. If you'd like to check it out and/or install the update... Head on over to Slacker.com. One of the more notable apps to appear on the scene this week was Elertify. This killer new app displays popup messages on your PC when new email, SMS messages, or phone calls come in. Not only will you see the popups on your monitor, but you can set audio alerts as well. Very cool. If you're tired of having to pick up your Berry to see what's coming in to you, Elertify is an awesome solution. Are you a regular eBay-er? Do a lot of buying and selling on the world's most popular auction site? With Mobile Auction Manager for eBay, you can check auctions, search for items, make bids and even get alerts when you've been outbid. Handy for sure, especially if you're not around your desktop when bidding on an item. For more you can check it out in our store. It's currently selling for $2.50. Worth every penny if you're an eBay addict! New from Anagram Technologies, Copy2Contact allows you to save any contact info to your address book or put new events in your calendar from everyday messages you receive all the time. It will automatically enter contact and appointment info into your address book or calendar from any plain text email, SMS message, search result, and more... Eliminate the need to copy and paste, and give this one a try! My Electrical Calculator is compatible with all current BlackBerry devices, so check it out here. Another solid Solitaire entry into our store, 365 Solitaire Club brings a beautiful interface, wide variety of games, and unique play modes to your BlackBerry. Play all of the classics including Spider, Klondike, Yukon and more. You can even play the 365 Calendar Tour and Seasons modes which put you to the test in a new game every day. 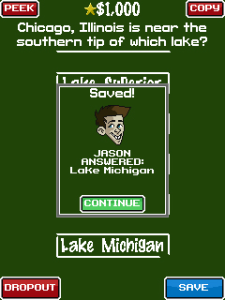 There's also live chat, and a high score upload feature. 365 Solitaire Club is a must-see app for any Solitaire junkie. This app could save your life! One button access to emergency info (contacts / blood type / allergies). If emergency medical look on your phone they will see the important info you left for them. Animated charging monitor, makes battery status & temperature easily visible, + clocks. Make your own ringtones for free! Supports following audio file formats: WAV, OGG, MP3, MP2, M4a, Wv, Flac, WMA and AAC. Works as ringtones maker as well as music editor. Download Free Trail Now! This app will display the month and date right on the calendar icon. The original, best-selling mobile finance application now updated for BlackBerry! Record transactions for multiple accounts while on the go. Supports QIF, XLS and HTML exports. Are you smarter than a 5th grader? That's the question developer's at Capcom want to find out. Based on the FOX TV show 'Are You Smarter Than a 5th Grader? ', this highly interactive question game puts you to the test... asking you questions on history, social studies, math, literature and much more. Can you make it all the way to the $1 million question and answer correctly? Give it a spin to find out for yourself... But first, you'll need to pony up $4.99 to purchase. Tired of looking at the same wallpaper time after time, after time? With Wallpaper Changer Lite you can rotate wallpaper from your internal device memory or SD card. It supports jpg, tif, png and bmp file formats, and is easy on your battery. It is a 'Lite' version however, and you're limited to a max of 10 wallpapers. The full version allows for customizable rotation times and the option to rotate in order or by random. Wallpaper Changer Lite is compatible with the Curve 8530, Storm 9500/9530, Storm2, Tour and Bold 9700.